Golden Axe ransomware is a file-encrypting threat which was recently discovered by cybersecurity experts and announced on Twitter. This dangerous infection has been noticed while trying to infiltrate users computers by hacking RDP (Remote Desktop Protocol). What is unique about Golden Axe virus is that the ransomware encrypts files by adding a completely random five-character extension. Additionally, it places a copy of the ransom note in each existing folder. Crooks display the message in three different types of formats: # instructions-ID#.txt, # instructions-ID#.vbs, and # instructions-ID#.jpg. In these notes, victims are informed about the secret encryption process and are urged to make contact with the criminals via these email addresses: xxback@keemail.me or darkusmbackup@protonmail.com. The hackers seek to gain income from infected users, so they demand a ransom usually in Bitcoin and claim that the decryption tool will be received after the money is transferred. Sadly, such promises are often not fulfilled as the crooks are very likely to scam people. You can recognize Golden Axe ransomware by a file named Flash_Player.exe that it leaves on the infected machine. Additionally, this file locking malware might drop malicious payload all over the system. For example, it might create suspicious registry keys which will allow executing different actions. Also, you might find malware-related processes running in the Windows Task Manager which need to be stopped immediately to prevent further possible damage. You need to be aware that ransomware infections can carry out a big variety of damaging activities on your infected computer. Be quick to remove Golden Axe virus from your system. However, note that you need to discover all malware-related content on the infected machine and just then proceed with the elimination. For malware detection purposes, we offer to download and install software such as Reimage or Malwarebytes MalwarebytesCombo Cleaner. If you are considering to perform the Golden Axe ransomware removal on your own, you should know that it is not a good option to make. File-encrypting malware might be extremely difficult to detect by yourself, and even if you do find the infection source, you might not be capable of detecting all locations where additional malware-related content might be hiding and performing illegitimate activities. Ransomware is known for its capability to lockup documents and make them unusable properly. However, these threats, including Golden Axe ransomware, might install other dangerous malware into the Windows computer system, mess with the system's files, settings, launch hazardous payloads in different locations, etc. After detection, such malware needs to be removed as soon as possible. Cybersecurity specialists from NoVirus.uk claim that ransomware is most likely to be found in infected attachments that come together with rogue email messages. In some cases, crooks might even pretend to from reliable organizations or shipping companies such as FedEx. Users can get tricked by the legitimate look of the email much easier this way. We recommend investigating each email message that you receive even if the letter falls straight to your inbox. If you were not expecting to receive anything important lately, we suggest avoiding opening the dubious email or its attachments. Mostly, reliable firms do not contact users via emails only, they make phone calls, or even do both. Continuously, various malware, including ransomware, can be spread via infected third-party websites. For example, free torrent downloading pages often lack recommended protection which lets the criminals inject harmful objects into various software packages, program downloading hyperlinks, or other similar locations. If you are using Windows and have spotted a malicious infection on your computer system, we should urge you to get rid of the cyber threat without any hesitation. If ransomware is what has been bothering you lately and preventing you from proper access to your files, you need to remove Golden Axe virus by using specific anti-malware programs. Before you proceed with the Golden Axe ransomware removal, install a tool such as Reimage, Malwarebytes MalwarebytesCombo Cleaner, or Plumbytes Anti-MalwareMalwarebytes Malwarebytes to check all locations in your computer in case malicious components are hidden somewhere else. Do not try to eliminate the file-encrypting threat without using any professional help as you might cause only more damage to your computer system. Additionally, we offer to try some data recovery steps that are provided below the article. These methods might help to recover some data that was encrypted by Golden Axe ransomware. For the future, make sure that you store copies of important data on remote servers or devices such as USB drives, iCloud servers. Log in to your infected account and start the browser. Download Reimage or other legitimate anti-spyware program. Update it before a full system scan and remove malicious files that belong to your ransomware and complete Golden Axe removal. When a new window shows up, click Next and select your restore point that is prior the infiltration of Golden Axe. After doing that, click Next. Once you restore your system to a previous date, download and scan your computer with Reimage and make sure that Golden Axe removal is performed successfully. Guide which is presented above is supposed to help you remove Golden Axe from your computer. To recover your encrypted files, we recommend using a detailed guide prepared by 2-spyware.com security experts. This software might appear truly helpful if you succeed with each step correctly. Try this method if you have enabled the System Restore function in the past. If Shadow Copies of encrypted documents are safe and undamaged, you can give this method a try. 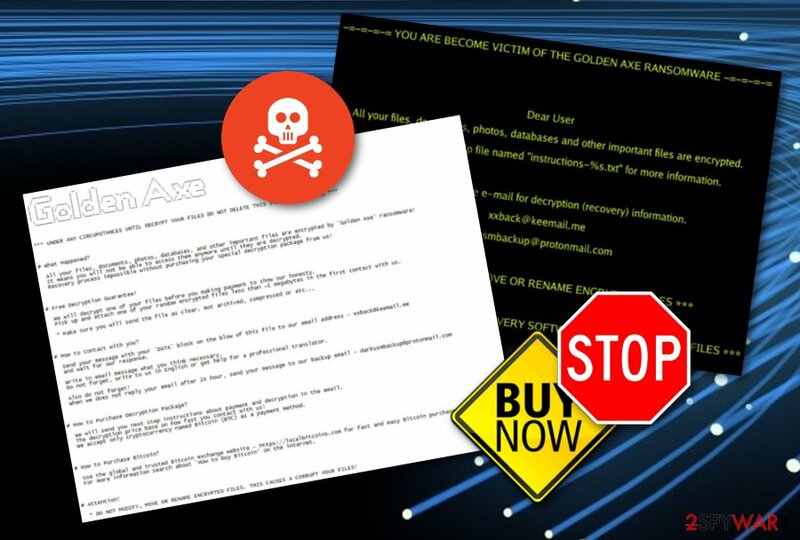 Currently, no official Golden Axe ransomware decryptor has been released by tech experts. ^ mol69. GoldenAxeRansomware. Twitter. tkanalyst. Status. ^ Margaret Rouse. Remote desktop protocol (RDP). Search Enterprise Desktop. Tech Target. ^ NoVirus.uk. NoVirus.uk. Malware news and avoiding measures. This entry was posted on 2019-03-19 at 04:45 and is filed under Ransomware, Viruses. You can quickly scan the QR code with your mobile device and have Golden Axe ransomware manual removal instructions right in your pocket. How did you remove Golden Axe virus?